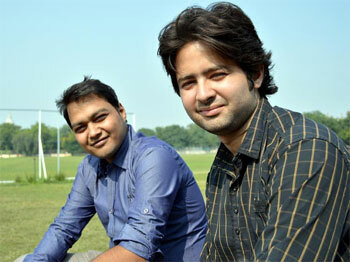 Image: Aditya Agrawal and Arpit Sarin's passion is driven by a sense of social commitment. Photograph, courtesy: Business Standard. It’s not always required to be highly innovative to launch a business, even identifying problems which may be typical to a particular region or locality can also throw up opportunities. That is precisely what Aditya Agrawal, a graduate in Electrical and Electronics Engineering and his friend Arpit Sarin are doing now in Varanasi and planning to take it to many other cities in Uttar Pradesh. During the hot summer of 2013, Agrawal and Sarin went around the streets of Varanasi doing a door-to-door survey among some 2000 households only to realise that how getting regular supply of medicines was a major issue among the patients. It was more challenging for patients suffering from chronic diseases and senior citizens whose children reside in other cities due to job demands, as medicine stores are primarily located in and around hospitals. It struck them so much that both of them are now trying to solve that problem using the power of internet and mobile telephony. Within nine months after conducting the survey, Agrawal and Sarin launched a venture called dawailelo.com to not only supply medicines to the door steps of the patients, but also to assist them with the database of doctors available in the region for different kinds of ailments. While needy patients as of now are placing orders by making phone calls, booking online or through whatsapp message, Agrawal is now in the process of developing a mobile application with the assistance of Microsoft under the latter’s BizSpark programme which among other things will have geo-tagging of doctors and a reminder tool for patients before their stock of medicines gets exhausted. The young entrepreneurs passion is also driven by a sense of social commitment. While they are supplying medicines to the doorsteps at a discount of 10 per cent on the retail price, they have requested some 150 doctors in Varanasi to offer one hour of consulting services every week free of costs to needy patients. They are providing the medicines prescribed during those periods free of costs with the help of various charitable organizations and programmes. “When I was a child, I knew that such problems do exist but I did not have a solution at that point of time. That’s why we decided to do a proper survey during the vacation time in 2013 and found that how senior citizens many a times miss their doses of medicines due to travel concerns as medicines are sold at the premises nearby the doctors,” said Agrawal who is presently pursuing his MBA at Faculty of Management Studies at Banaras Hindu University (BHU). So far, they have spent around Rs 400,000 towards their venture which they mostly raised by offering tuition to students and conducting classes at coaching centres. The cost is primarily towards marketing them while they are able to manage the operational expenses every month out of the sales. Recently, the start-up has joined hands with Bajaj Allianz as a part of which they are catering to the needs of the insurer’s policy holders. “This has not only given us a huge client base, we are planning to expand our services to four more cities including Lucknow, Agra, Kanpur and Allahabad,” Agrawal added. Dawalilelo.com is also conducting a programme called 'Dawaidedo’ appealing patients and their family members to donate them the leftover medicines when doctors change prescription or any other reason. They are distributing the patients among those who can’t otherwise afford it. The company has now three core team members, six extended team members and few others who are offering their services as volunteers. In future, Agrawal plans to relocate the company's headquarters to Delhi.